We’re so excited for the Holidays! This is the BEST time of year! 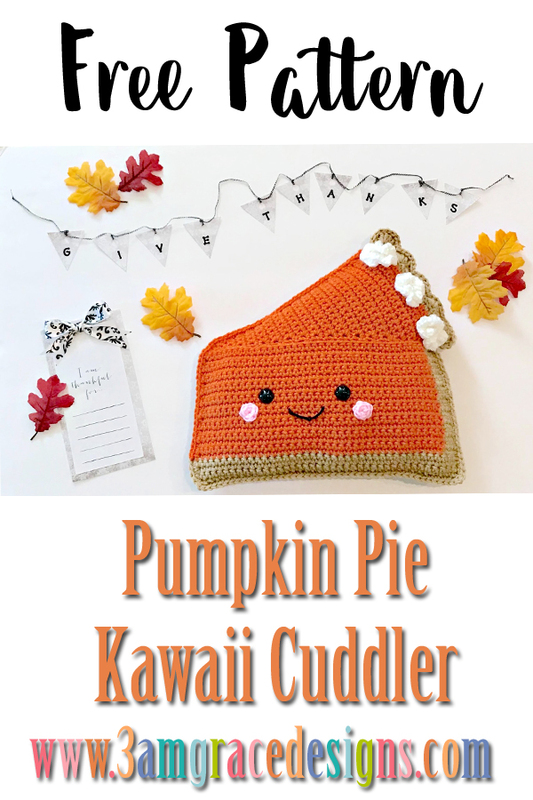 Our Pumpkin Pie Kawaii Cuddler™ crochet pattern would love to be part of your Thanksgiving decor! We hope you enjoy making your very own Pumpkin Pie! We can’t wait to see your creativity. When you complete one, please post it in our Facebook group or tag us on Instagram #3amgracedesigns. We love seeing your work! * Worsted Weight Yarn in Hobby Lobby “I Love This Yarn” Toasted Almond, Desert Glaze, White, and Pink. Round 3 – Ch1, turn, 4SC in each front loop around. *Place safety eyes between rows 15 & 16 from the bottom of the pie crust, roughly nine stitches apart. *Sew or glue whip cream in desired locations. Hi, I don’t know what I am doing wrong but I cannot seem to grasp the beginning of the pie topping. I start at the very left of the pie (away from the side crust) and I chain two, sc in the second chain from the top but from there I don’t know if I chain 1 and turn or if I don’t chain 1 and just turn, or if I don’t turn at all. I’m just so confused 😕❓. Help! The Pie Topping is worked as its own piece. It’s whipstitched to the pie when it’s complete. Row 1 is started in your hands as a Chain 2, not attached to the pie. Hope that helps!